The Better Living Center, a large food pantry in Spokane, is switching to a client-centered model. Just after 8 on a Tuesday morning, Loretta Kern starts pulling canned goods off a shelf and filling brown paper bags, which she places in a few grocery carts lined up along another aisle. Soon, she'll take each cart along the shelves, stacking up loaves of bread, a carton of milk, spaghetti squash, cereal and other items that people might need, then repeating the process with the next cart. "A long time ago, I had eight children in Wyoming, and people were very kind to us," Kern says as she keeps loading bags with food. "I know how it is to be hungry." On the other side of a closed door, clients young and old will soon filter into the Better Living Center food pantry and provide identification and some family information to Linda Westermeyer, who's running the front desk this morning. In the back, other volunteers start stocking shelves with this morning's food delivery. Retiree Albert Haas helps decide what should come off the truck, and puzzles over some of the boxes that appear to have seven-and-a-half-dozen hard cooked eggs in them. Around the corner, Corey Babcock, who's here on required community service, wipes down tubs of sour cream affected by a few burst containers, and lines the good ones up in a glass-doored cooler. The clients sit and wait in chairs. When they hear their name called, they're told to walk right back out the front door and down the sidewalk to another door, where a volunteer pushes one of the full carts out to them so they can take it to their car. This is pretty much how they've run things here for the 17 years Kern has volunteered at the pantry, just off Division on North Foothills Drive. But come January, the clients will be walking these aisles themselves, choosing their own food and taking an active role in the experience, as the pantry switches to what's known as a "client choice" model. It's being pushed by Second Harvest, which distributes food to some 250 partner agencies and pantries in Eastern Washington and North Idaho. Advocates say it'll not only help reduce food waste, as people won't have to take things they don't want, but will also hopefully guide folks to healthier options and restore some dignity in the process for them. Switching the region's pantries over to the grocery-store-like experience definitely takes a lot of work, Wallis says, as it often demands reorganization of existing spaces, and sometimes retraining for volunteers. 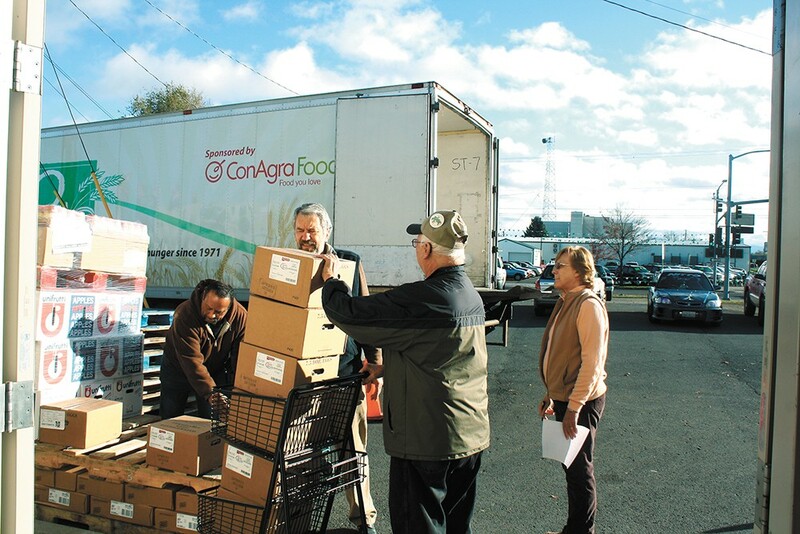 "This initiative is to kind of work with those agencies and get them to set up their food banks in a more healthful way, so it's easier for people to choose the more healthful food," says Julie Humphreys, spokeswoman for Second Harvest. "We need to make that simpler for folks." But once those changes are in place, it's easier to make other changes that can nudge people in the direction of healthy eating, Wallis says. "Once that's there, there's little things that you can do to encourage people to make healthier choices, like having healthier choices at eye level," Wallis says. "Even, like, produce displays, have them be appealing and well lit, so 'I'm seeing there's a lot of things available and easy to grab that are right in front of me.'" Like grocery stores, some locations may encourage clients to take produce by putting together items needed for a recipe, and offering samples to people as they "shop," Wallis says. The layout also better lends itself to educational displays, like government-recommended "MyPlate" portion sizes that can quickly show which items are considered grains or vegetables, and how much of your diet they should make up. "How do we help people tip the needle in the right direction?" Wallis asks. "What the research shows is by allowing people to make the choice, they make healthier choices." The Better Living Center, the third-largest food pantry in Spokane, is the latest and one of the largest distributors to switch to the model. Getting there has taken more than a year, as the pantry's board had to give approval for the change and organize funding. By Oct. 8, with grants lined up with the pantry's parent organization, Adventist Community Services, as well as matching donors, volunteers came in for a "one-week blitz" of room gutting, floor polishing, painting and remodeling to move the entryway and prepare to use more of the space in the building, says Gayle Haeger, leader of the food bank. The center is still working out the details for how checklists might work to guide how much each family can take, and once things are about set, they'll buy more grocery carts. Eventually, they hope to offer more classes, and maybe even open a dental clinic in rooms at the other end of their building, Haeger says. "We're not offering classes now, because everything is upside down, but we want to be able to offer healthy eating, diabetes recovery, depression recovery, and our ultimate goal is to offer a free dental clinic," she says. "That's still on the drawing board, but there are people working on that. It's really exciting." In the meantime, the center continues to serve clients like Janet Marton, a great-grandmother who's outlived two husbands, and currently lives with her daughter and granddaughter. They have a hard time making ends meet: Her daughter has health problems, and Marton recently lost her transportation after being hit by a drunk driver a few weeks ago, so she hitches a ride to the food pantry with whoever is coming. "It's been a real struggle all these years," Marton says while waiting for volunteers to fill her cart in the other room. "We depend on it. We do count on the juices — I'm a diabetic, and with the health issues of my family, it all works into our menu and feeding ourselves, and supplements the food stamps." After a few minutes, Marton's name is called, and she grabs her cane to walk outside and push her cart of food across the broken pavement of the parking lot to her friend's truck. As Marton walks her cart back up the sidewalk, Shannon Lehman stands outside the center, shaking an egg next to her ear as she listens to see if it's hard boiled, before shrugging and loading the rest of the food into her bike trailer. Lehman and her husband have kids in eighth grade and kindergarten, and have been coming to the pantry for years to help keep their kitchen full. "To me, I love when I get stuff I would never think about buying," Lehman says. "It makes me get creative, and look up recipes for things like bok choy." While it's good to feel resourceful, she says, she does look forward to the new system, if for no other reason than to pass on at least one regional grain a little more often.